FILE - Heads of state and government pose during a photo call before the official opening of the 27th African Union (AU) Summit in Kigali on July 17, 2016. The 27th African Union summit has wrapped up in Kigali, Rwanda. Perhaps the most notable action, or inaction, to come from the event was that delegates did not elect a new chairperson. None of the three candidates contesting the position received the necessary two-thirds majority vote, so the elections have been postponed until January and most likely will include new candidates. "I think there's been general consensus, even among some of the member states themselves, that the three candidates were not the best that Africa had to offer, so you know, we've got an opportunity now," said Elissa Jobson, adviser on African Union relations for the International Crisis Group. "It gives the member states the chance to look and find the better candidates — someone who can guide the African Union at what is actually quite a crucial time for them in terms of peace and security," she added. But J. Peter Pham, director of the Washington-based Africa Center at the Atlantic Council, says the bigger issue is that of the entire 10-member commission, whose elections have also been postponed until January. He says that in 2003, 73 candidates ran for the 10 slots; in 2008, there were 45 candidates; in 2012, 29 candidates; and this time around, 40 candidates. Pham says this overall diminishing pool of candidates is worth noting, because some regions have already decided on their desired candidates ahead of time and so the vote is simply a formality. 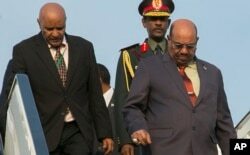 FILE - Sudan President Omar al-Bashir, right, arrives in Kigali, Rwanda, July 16, 2016, to attend an African Union summit. He defied an international warrant of arrest after public assurances from Rwandan leaders that he would not be arrested. "I think what's happening is, instead of competitive elections, what we're having is essentially a lot of diplomacy ahead of time, so the elections become pro forma," he said. In a step toward self-reliance, the AU agreed to levy taxes on certain imports in order to fund itself, since external donors supply much of its current annual budget of almost $500 million. U.N. Secretary-General Ban Ki-moon, through his spokesperson, noted what he called the "innovative funding arrangements aimed at providing the AU, via the Peace Fund, with increased financial means to address the peace and security challenges facing the continent." Pham says it's about time. "Whether this is actually achieved or not remains to be seen. Up to date, it's been rather embarrassing that for an emerging continent, Africa is extremely dependent on outsiders to even fund its own governance mechanisms," Pham said. The African Union announced its support for a request made by IGAD Plus — the East African regional bloc that includes Rwanda, South Africa, Nigeria and Algeria — for African troops to help U.N. peacekeepers in South Sudan. That country's peace is tenuously holding under a cease-fire announced last week after violence rocked the capital, Juba. That request, which now goes to the U.N. Security Council, includes a revised mandate asking for the deployment of a regional protection force. "Which sends a sign to Juba that the continent is serious about this and that they do want to see the violence ended and lasting resolution found," said ICG's Jobson. South Sudan's president, Salva Kiir, has rejected the idea of additional foreign troops entering his country. Separately, the first "African e-passports" were issued to AU heads of state, permanent representatives of these states and ministers of foreign affairs, aiming to ease restrictions on the movement of people, goods and services across borders. And, Morocco formally asked to rejoin the African Union. It left the Organization of African Unity, the AU's predecessor, in 1984 because the AU recognized the independence of Western Sahara. African Union Summit: Who Will Succeed Dlamini-Zuma?